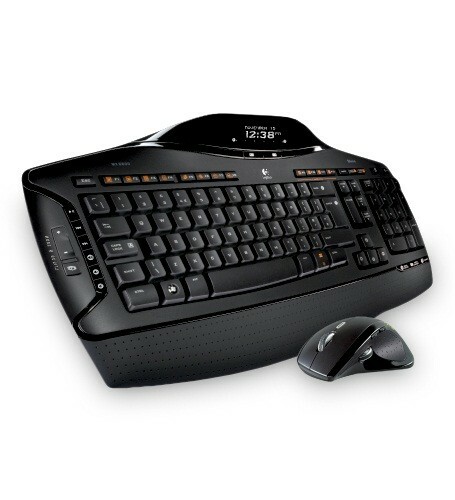 A laser mouse with hyper-fast scrolling and a keyboard with an integrated LCD give you the speed you need. And the control you crave. The rechargeable laser mouse lets you speed through documents or navigate with smooth precision. An integrated LCD lets you do more - like play music and use the calculator - right from your keyboard. You can work or play where you want with long-range, reliable Bluetooth® 2.0 technology that’s simple to setup. The MX™ Revolution mouse features a motorized, smart scroll wheel and rapid-charging rechargeability. With the integrated LCD, you can play music, use the calculator, receive incoming message notifications, check the time and date, and more. You’ll enjoy a reliable wireless connection from up to 30 feet with virtually no interference. And it’s pre-configured, so you’ll be ready to go right away. Because you push yourself to the max, this mouse is designed to help minimize hand fatigue. Comfortable hands like comfortable mice. You can hold this mouse with ease - the thumb scoop makes it easy not to squeeze. You’ll fly through long documents and Web pages with just a flick of the nearly frictionless scroll wheel. Excited about hyper-fast scrolling? The palm rest helps position your hands comfortably on the keyboard - and offers a comfortable place to rest your palms when you’re not typing. The flat keyboard design creates a natural typing feel that keeps you comfortable even after long hours. Typing can be tiring. Find out how Logitech helps you get comfortable.